There is no amount of photos, video, or stories that can prepare a person for the incredibly captivating country that is Greece. It's a place that few people visit just once. Whether it's the jaw-dropping scenery, the hospitable people, the fascinating history, the laid-back lifestyle, or the endless exploring opportunities, Greece leaves travelers in awe. Catch the sun setting over Santorini's cliffs, start your day with a dive into the warm Aegean Sea, sip Ouzo in the shadow of the Acropolis, explore the famously gay island of Mykonos... so many options, all guaranteed to be unforgettable. Our 12-day Greece trips promise to deliver the best of Athens and the Greek Islands with stops in dramatic Santorini, cosmopolitan Mykonos, and peaceful Milos. Our trips are, and always have been, laid-back, leaving plenty of room for spontaneity and adventure. No rushing around, no stress, no limiting daily itineraries, just a great group of guys who are all excited and ready to explore and have fun. And isn't that what travel is all about? So whether you're a history buff, beach bum, adventure addict, or a mix of all different traveler-types, our Greece adventure won't disappoint. 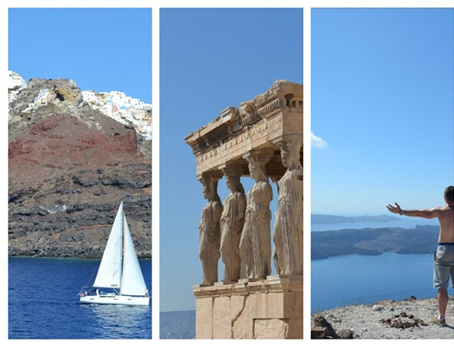 Our 12 days in Greece will be surrounded by incredible history and turquoise water and most of the activities available revolve around those two things! Listed below are just a few of the activities that will be available to you during the trip. Our unhurried travel concept ensures you'll have enough time to take advantage of as much (or as little!) as you'd like to make this your trip of a lifetime! The following is a general itinerary of our 12-day Greece trip, visiting the most captivating places that Greece has to offer. Although the destinations won't change, the order of the itinerary will depend on current Greek ferry schedules. A city that's been around for 3400 years has definitely built up its fair share of interesting things to see and do! 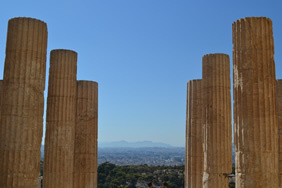 Our time in Athens is centred around the Monastiraki and Plaka areas of city, the home of the famous Acropolis and Parthenon. The streets that lie in the shadow of these magnificent ancient ruins are full of unique cafes, shops and restaurants where locals and travelers gather in the evenings to the sound of live local bands. 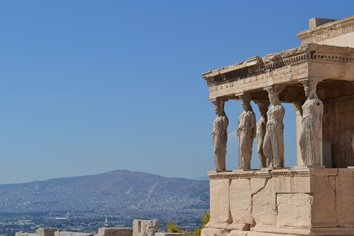 We'll have enough time here to immerse ourselves into the old and new of Athens by visiting the Acropolis sites, including the Parthenon, Erechtheion, and the Temple of the Athena Nike, as well as the famous Archeological Museum. In the evenings we'll hit the streets and explore the bustling Monastiraki and Gazi areas where we'll sip ouzo with locals, browse local shops and, if you've still got energy, check out the lively local Athens nightlife. 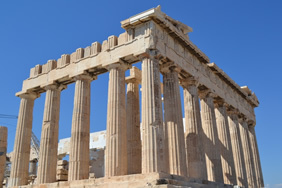 The sights in this city will fascinate you, but it's the local Greeks here that will give you a real appreciation for the people and culture of this country. Milos is an unspoiled paradise, an undiscovered oasis of stunning beaches, ancient ruins, and breathtaking vistas, inhabited by the friendliest people in Greece. Our "Greek mother" Mary is just one of the passionately proud residents of Milos who can't wait to tell you all about her island. We'll explore this paradise by dune-buggy, allowing us to get off the beaten track and really experience the best this island has to offer! This "undiscovered" island has it all, ancient ruins, secluded beaches, cliffs, turquoise waters, and charming towns. 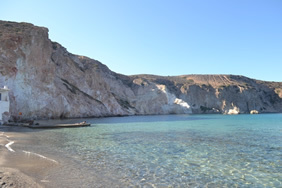 To really experience the best of Milos we explore this island by dune buggy, allowing us to get to the hidden gems that busses just can't reach! 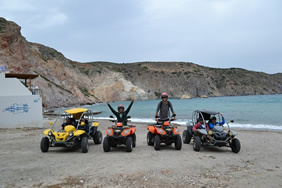 That's right, once we arrive onto Milos we all jump into dune buggies for 3 days of exploring! From our beachside base in the town of Pollonia, to the moon-like landscape of Mandrakia, and the ancient ruins of Plaka to the secluded turquoise swimming hole of Paleochori, this island really is a Greek paradise. Milos is not only spoiled by natural beauty, but is also home to the friendliest people in Greece. Our host family here is passionately proud of their island and love to show it off. 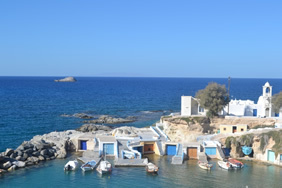 With 5,000 friendly residents on the island and plenty to explore, Milos will feel like our Greek home. 3500 years ago one of the largest volcano eruptions in the world occurred in Greece's Cyclades island group. Half of the volcano crumbled into the sea, leaving the remaining half of the volcano rising up out of the sea for a dramatic natural landscape. 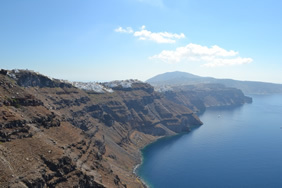 On the cliffs of this volcanic caldera sits Santorini's main towns of Fira, Oia, and our base, Imerovigli. Imagine eating breakfast on your balcony perched 400 feet over the sea, with Santorini's famous white-washed paths and buildings hanging onto the hills. The sunsets here are legendary, the vistas to-die-for, but there are also great hikes, white, red, and black sand beaches and lots of exploring opportunities! 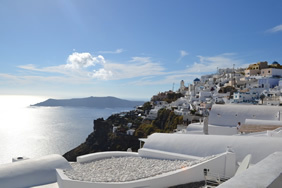 Whether you're content wandering the maze-like streets, sipping coffee on a cliff, or you'd rather take a trip to the hot springs, down to the many stunning relaxed beaches of the east coast, or tour the island's vineyards, Santorini will be one of those places that'll be ingrained in your memory forever. There's a reason why Santorini is one of the most famous islands in the world, and trust us, it's not overrated. Mykonos has long been known for its white-sand beaches, winding white-washed alleyways, windmills, and ancient ruins. But it sets itself apart from its surrounding islands by being the biggest gay destination in Greece! It's not only several gay beaches and bars that have make Mykonos a gay Mecca. It's the unique hidden piano bar where Phyllis plays the piano while the patrons sing along at the tops of their lungs. It's the locals and travelers gathering to watch the sun set over the Aegean Sea being serenaded with a drag show. It's the friendliest jazz lounge you've ever seen, where the staff, locals and travelers go out of their way to meet and chat to each other. And it's the warm Aegean Sea washing up against a beach full of Speedos and rainbow flags. 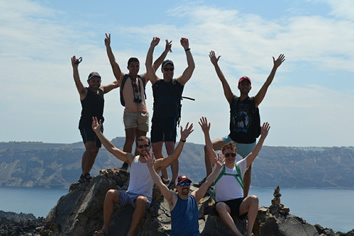 Mykonos is a place where we don't just feel accepted, we feel welcomed and comfortable, just how a gay Mecca should be! 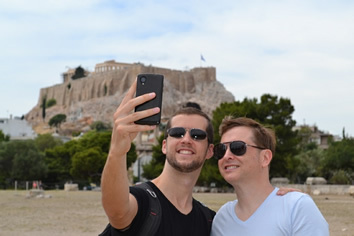 Our trip finishes in Athens - Greece's largest city for one last chance to stock up on some delicious Greek food and get our last shots of ancient Acropolis before heading home. But rest assured, after these 12 days in Greece, it probably won't be your last visit. Don't worry about getting chilly, our trips are scheduled in the warm summer months ensuring maximum warmth and sunshine! Temperatures during summer generally average highs of 27C/81F, and lows of 21C/70F, although weather can sometimes be unpredictable so it's always good to bring a couple items of warm clothing just to be safe. Greek summers receive very little rain so it's not necessary to pack for rainstorms. Our advice is simple. Pack your bag, then take half of those things out and leave them back home. It's common to hear people wishing they'd packed less stuff, but we've never heard anyone complain that they didn't bring enough. Even if you realize you forget to pack some crucial item you can always pick up a replacement once you arrive in Athens. Oh, and there's no need to pack gallons of North American water in your bag just in case there's no fresh drinking water in Greece… yes, we actually had someone do that, and yes you can drink tap water in Greece. We REALLY suggest just bringing your regular bank card from home and using the Greek ATMs to get cash; in our experience it's much cheaper than any currency exchange service in Greece or even at home. Greece uses the Euro as their local currency so once you arrive into Athens airport you should stock up on some Euro cash. Tipping isn't a native Greek custom, however, it is always appreciated by local service staff. We suggest tipping for any services that go above and beyond expectations. That extra dollar or two on a dinner bill is extremely appreciated by the service staff. We have pretty high standards when it comes to choosing our accommodations, and trust us, we've done plenty of room-sniffing, pillow-patting, and bathroom inspections to make sure we stay at quality spots. To be approved as a Detours accommodations provider, a guesthouse must: be locally owned (to support the local community), be in an amazing location (close to the beach or other hot spots), AND be gay-owned or gay-friendly. We won't be staying in 5-star Ritz-Carltons but we also won't subject you to anything we wouldn't want to stay in ourselves. Clean and comfortable 3-4 stars, you can count on that! All of our trip leaders are gay, and all certified leaders must undergo a rigorous training routine that includes deep-fried cricket eating, and impromptu dancing tests. Apart from these vital skills, we require our leaders to know their stuff really, really well. Underneath their fun and quirky facades, our guides are experts and passionate about what they do. Don't hesitate to ask them to teach you some Greek or question them about a random statue you might see along the way. Their job is to help ensure that this is your trip of a lifetime by taking the hassle out of your trip and enabling you to experience everything you came to Greece for. We do absolutely everything possible to avoid needing such a mundane awakening. A world without alarm clocks is one we want to be part of, and your "rise and shine" while in Greece should come from the sound of crashing waves or church bells in the distance. However, sometimes due to current ferry schedules we are required to make early departures, but we do everything we can to minimize this. Extending Your Trip For many people, 12 days in Greece just isn't enough time. If you're lucky enough to be able to stay longer, or if you decide to quit your job and become a beach bum in the Mediterranean for the rest of your life, we'd be happy to extend (or cancel!) your return flight. We've been all over the area, so don't think twice about asking where to go or what to do after your Detours trip is complete. Turkey, Israel, Italy... many interesting destinations are close-by. Our Detours groups are run with a minimum of 4 travelers and up to a maximum of 15 travelers with one trip leader and 20 with two trip leaders. Ages of group members vary but the majority of our travelers are in their 30's and 40's. Whatever the age of the guys on our trips everyone's already got something in common, an exciting new experience in a new country! Each group is led by a Detours trip leader who is there to ensure everything goes off without a hitch, allowing you to focus on having the time of your life! No problem! Don't worry, lots of our travelers come solo and our trip will provide plenty of chances to meet great people both inside and outside of our group, including other solos. As far as your accommodations go, you've got two choices. We can either pair you up with another solo group member in a two-bed room for no extra charge, or you can have your own room for a reasonable surcharge. Relax – we won't keep you from updating your Facebook status the whole trip. There are internet cafes and WiFi all over the place. If you're more the "E.T." type and would just rather call home, feel free to pick up a calling card at a corner store and make use of the many local payphones. Alternatively, if your mobile phone is "unlocked" you can pick up a local Greek SIM card which is quite affordable. Further information can be found in your "Trip Preparations" guidebook which will be available to you after your trip signup. However, if you have any further questions about your Greek experience please visit our FAQ page or contact us.